Rachel Maddow: The Fresh Air Interview The popular MSNBC host talks about her start in broadcasting, her life and her new book Drift: The Unmooring of American Military Power, in which she argues that America's national defense has become disconnected from public oversight. Rachel Maddow hosts the nightly news talk show The Rachel Maddow Show on MSNBC. For much of the past decade, journalist Rachel Maddow has hosted her own radio and TV shows. And for much of that time, the popular MSNBC host has been thinking about how the United States uses military force — and how it starts and end wars. 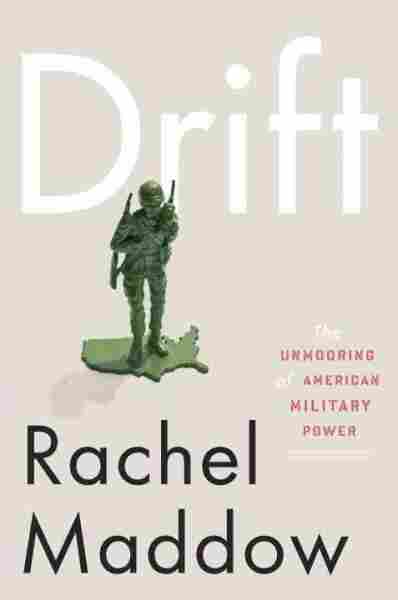 Maddow's new book Drift: The Unmooring of American Military Power traces how U.S. national intelligence agencies have taken over duties that were once assigned to the military, and how this shift has increased the public disconnect from the consequences of war. "Politically, secrecy is a great excuse," Maddow tells Fresh Air's Terry Gross. "If something is being done on a secret basis in national security, that's a great reason for elected officials to not talk about it. And that's a great way to shirk accountability for it with the public." That lack of accountability, says Maddow, lets America's national defense operate without public oversight or knowledge. "When things are done in secret in our name, we can be held accountable for them, even if we can't hold accountable our government for directing it," she says. "And that feels very un-American to me." Using intelligence agencies and private contractors has also increasingly disconnected the American public from the consequences of war, says Maddow. "I don't think anybody set out to make us so divorced from the wars that we wage," she says. "But all of these little tweaks — all of these little changes that we made — had the effect of letting a president wage war without political restraint and letting us wage war in a way where we didn't necessarily notice or know the names of all of those who were deployed in our name. Because a lot of them were working for companies that didn't have any obligation to report to us when their people were killed. We ended up doing stuff in a way that insulated the American public from what our military was doing to the point where we don't feel much friction when Americans go downrange." Maddow says she grew up in a household where public service and military service were both respected. Her father served in Vietnam and left the service a year before she was born. "A lot of members of my family have served, a lot of people I grew up with served," she says. "I think had it been legal for openly gay people to serve in the military in the time I might have been considering signing up. I think service is honorable, and that was always inculcated in me." Maddow broke into the broadcasting business after graduate school, while she was living in western Massachusetts and taking on odd jobs while finishing up her doctoral dissertation. One day, her friends told her that the local morning radio show was looking for a person to read wire copy on air. She called the station, passed a test and was asked to come in for an audition. "They asked me to come in and just rip and read some AP news wire stuff, and I did it and I remember the host said to me, 'What have you been doing as your job?' And I said, 'Unloading trucks.' And he said, 'From what?' And I said, 'Bigger trucks.' And they said, 'You're hired,' " she says. "I got the joke, and I could read. So I got the job and I started the next day, and that was my first job in radio." But Maddow didn't have plans to stay in the media. She had been working as an AIDS activist for a decade and assumed she would return to activism after her dissertation was finished. "I did [radio] for exactly one year, and I needed to get my dissertation done," she says. "And I did my grad school in England, and I traveled to England to defend my dissertation and it went successfully, and that was a few weeks before 9/11. I came back, 9/11 happened and I found myself, surprisingly ... really wanting to get back on the radio." Maddow started calling local radio stations and asking if she could pick up a shift here and there. She then moved to Air America, where she hosted Unfiltered and The Rachel Maddow Show, a two-hour daily radio program. In 2008, Maddow started hosting The Rachel Maddow Show on MSNBC. The nightly news show features an opening essay on a news topic, commentators discussing important news events, interviews related to news and culture, and segments highlighting stories that otherwise might go unnoticed. Maddow also often challenges guests who offer themselves as experts without having the facts to back their statements up. "People who disagree on important issues don't agree on the facts," she says. "It used to be that we disagreed over the basic facts we were fighting over, and we had different opinions about them. Now I think we accept different sources of authority. ... And people can establish credibility on their own say-so as long as nobody follows the trail and calls them out on it." But even when Maddow disagrees with a guest, she says, she makes a point to thank them and wish them good luck at the end of each segment. "If I brought somebody into the discussion, it's because I believe they are worth hearing," she says. "Not necessarily because they always agree with me, but because they are going to say something that's going to advance our understanding of this [topic] that I've been trying to explain on TV. And so I am thankful for anybody who agrees to come onto the show. I'm thankful for their time, and I don't think personal animosity ever enters into it, even when I vehemently disagree with somebody. And particularly for people who disagree with me, I want them to feel like they've been treated fairly — they weren't ambushed, they weren't interrupted, they had a chance to say their piece. ... I don't want them to feel like it was an uncivil experience." "Nothing about me wants to write. I reject it like a transplanted organ. It's a little bit of a dark window into my soul. I don't mind writing scripts. I don't mind writing something that I'm going to read, because I think subconsciously, I'm confident that if I screw something up, or something is inelegant or embarrassing or even wrong, because I'm writing myself, I can ad-lib the correction on-air or fix it. When you're writing for the eye, it's unforgiving, and I find it hard for me to commit to a sentence." Essentially the process of working on my show is grinding your bones to dust each day an inch at a time. We work really long days, and it's really hard. "I think that humor has underappreciated explanatory value. If you are trying to explain something to a broad audience, using humor is sometimes a way to help people either make a leap in logic with you or shorthand to what's important about something. Usually when I use humor on the show, it's in the form of absurdity. I've pointed out something that somebody says is normal that I think is not normal, or something that should be seen as very serious that I don't think deserves seriousness. You can explain that away or you can poke fun at it, but sometimes it's not only shorter to poke fun at it, but also more effective at moving the argument along." "Essentially the process of working on my show is grinding your bones to dust each day an inch at a time. We work really long days, and it's really hard. Essentially the process is get in as early as you can, read as much as you can; we do a big news meeting early in the afternoon to debate and to talk about the universe of news for the day — to talk about what we're going to focus on. Once we've picked our various [topics] for the show, I've got an idea for a thesis or a series of facts to lay out for each one, and then I go and close the door and close the lights and turn into a cave-dwelling beast for as long as I can and just read and read and read, while the producers are collecting evidence and calling people and reporting. And then I confab with these brilliant, young, smart producers who work on my show, and it's a combination of us writing together, them writing something and bringing it to me, me writing. ... When 9 p.m. rolls around and it's time for my show to come on, it is a shock that it's 9 p.m., and I have to sprint to the makeup room every night with the show only 90 percent done." "To have somebody disavowing the reason why they're there talking to me in the first place, their complicity in this thing that they're denying any responsibility for, it doesn't bother me as a gay person — it bothers me as a rational human being. It bothers me as somebody who wants accountability and who is grossed out by people who shirk their responsibility." "I think because I was 17 and incredibly cocky and full of myself, and I thought that everything I had to do had to make a statement. I think I had a confrontational mindset. I think I was frustrated by the casual anti-gay stuff that I saw among college freshmen in the milieu that I was in. And my attitude toward that was not to try to bring people along gently, gently, and show people by my evident humanity their callousness. I just wanted to throw something up in peoples' faces. I'm not sure that I would do it that way now. I don't really have any regret about it. I wish I had been more sensitive to my parents. But I certainly don't regret coming out. I think that everybody has to find their own way on coming out issues. And some people decide never to. I tend to think it is always better to be out than not out. But not everybody has the option. And when I was a freshman in college, I felt like I had the option, and I exercised it with an exclamation point. I think it says more about being 17 than it does about being gay." "Ever since puberty, ever since I was 11 or 12, I've had cyclical depression. That's something that has been a defining feature of my life as an adult. It's manageable. But it's real. And it doesn't take away from my joy or my work or my energy, but coping with depression is something that is part of the everyday way that I live and have lived for as long as I can remember. ... Depression for me, you can't distract your way out of it. ... When you are depressed, it's like the rest of the world is the mother ship, and you're out there on a little pod and your line gets cut and you don't connect with anything. You sort of disappear. And so it's not something you can talk-therapy out of. It's really a chemical thing. You get adrenaline from work, but adrenaline is not a cure."